Tossing up between stock cabinets and custom-made cabinets for your home? From designing the cabinets of your dreams to increasing the value of your home, opting for custom cabinetry offers many benefits. When you choose ready-made or stock cabinets, your options are limited, and you can end up settling for something that isn’t quite suited to your tastes and needs. Turning to local cabinetmakers for a tailored design means you’re getting exactly what you want. Custom cabinetry allows you to take total control of the design to ensure it suits your personal style and preferences. From the materials to the colours, you can choose a look that works for you and your home. Some spaces have less storage solutions than they have room for. Custom-made cabinetry allows you to maximise your cabinets to suit your home, so no space is wasted. You can also choose what storage solutions best suit your lifestyle. For example, you might have your heart set on a spice cabinet for the kitchen. Custom cabinetry also allows you to have your cabinets at the perfect height – great if you’re particularly short or tall. Cabinets that are perfectly designed and optimised for your living spaces can add value to your home – particularly when installed in the kitchen and bathroom areas. If you’re considering selling your home, updating the cabinetry with custom-made designs could increase your home’s value. Stock cabinets generally require you to assemble and install them yourself. When you choose local cabinetmakers, you can trust the professionals to take care of everything from the design to the installation. And because professional cabinetmakers are expert craftsmen, their attention to detail will ensure the installation is done correctly so you can enjoy your new cabinets for years to come. You can’t beat the quality of custom cabinetry. 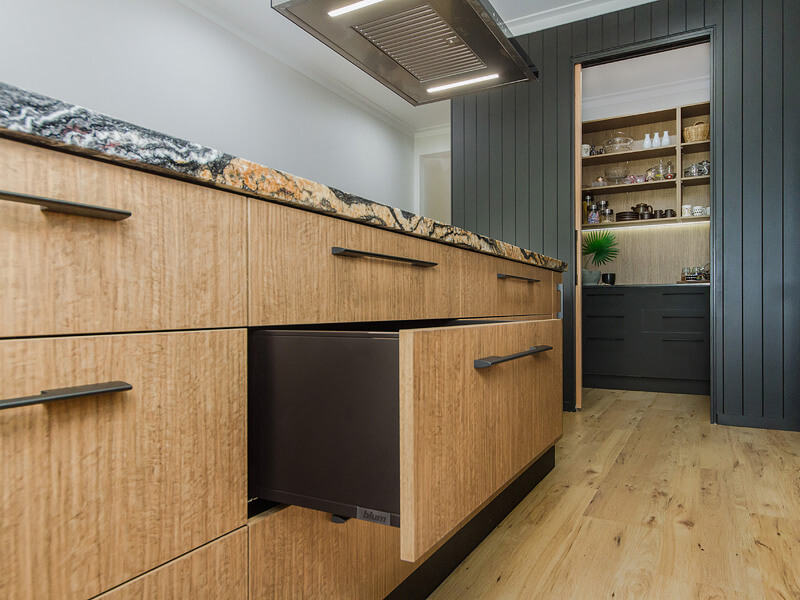 Our custom-made cabinets in Brisbane are constructed by experienced professionals from quality materials, and reviewed by a foreman before delivery. A & T Cabinetmakers specialise in custom bathroom vanities and custom kitchen cabinets in Brisbane. Call our professional team on 3801 2230 or request an obligation-free quote. © 2019 A&T Cabinet Makers.